Jarate är en burk som kastas och stänker vid nedslag. När den stänker ner fiender, tar de 35% mer skada. Hoppar man i vattnet tvättas Jarate bort. Jarate kan även bryta Spys förmåga att vara osynlig. När Jarate används på lagkamrater, kan den släcka alla typer av bränder. * Jarate är varken en form av eller ersättning för karate. Number One Assistant: Score 5 assists with the Jarate in a single round. Parting Shot: Headshot an enemy player the moment his invulnerability wears off. Pincushion: Hit an enemy with 3 arrows, without killing them. Rain on Their Parade: Jarate an enemy and the Medic healing him. Robbin’ Hood: Take down an intelligence carrier with a single arrow. Rode Hard, Put Away Wet: Jarate an enemy that you're dominating. Saturation Bombing: Jarate 4 enemy players with a single throw. Self-destruct Sequence: Headshot 10 enemy Snipers. Shafted: Stab an enemy with an arrow. Shock Treatment: Kill a spy whose backstab attempt was blocked by your Razorback. 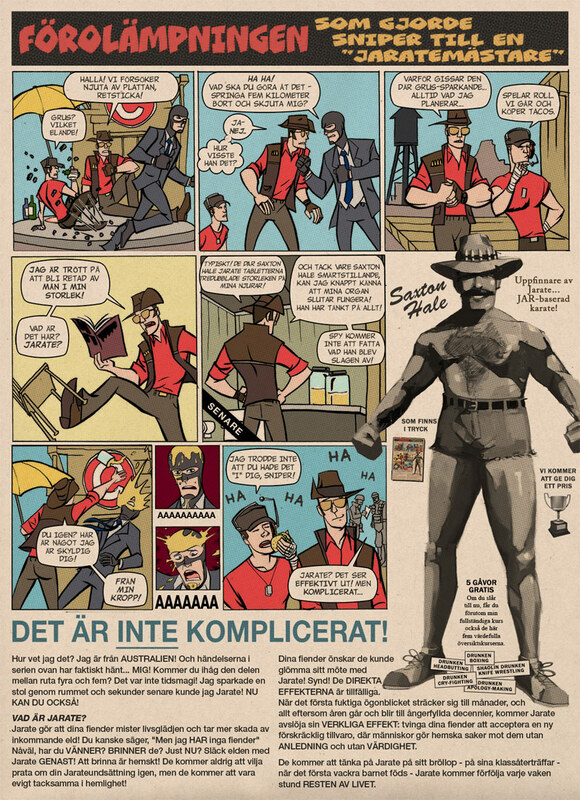 Shoot the Breeze: Kill a fully invisible Spy in a single hit. Socket to Him: Headshot an enemy Demoman. The Last Wave: Provide an enemy with a freezecam shot of you waving to them. Triple Prey: In a single round, kill the same enemy with 3 different weapons. Trust Your Feelings: Get 5 kills with the Sniper Rifle without your scope. Uberectomy: Kill a Medic that is ready to deploy an ÜberCharge. William Tell Overkill: Pin an enemy Heavy to the wall via his head. Australian Rules: Dominate an enemy Sniper. Be Efficient: Get 3 kills with the Sniper Rifle without missing a shot. Be Polite: Provide an enemy with a freezecam shot of you doffing your hat. Beaux and Arrows: Kill a Heavy & Medic pair with the bow. Consolation Prize: Get backstabbed 50 times. Dead Reckoning: Kill an enemy with an arrow while you're dead. De-sentry-lized: Destroy 3 Engineer sentry guns. Dropped Dead: Kill a Scout in midair with your Sniper Rifle or the Huntsman. Enemy at the Gate: Kill an opponent within the first second of a round. Friendship is Golden: Extinguish a burning teammate with your Jarate. Have a Plan: Capture the flag in CTF. Jarate Chop: Jarate and then kill 3 enemies with your Kukri. Jarring Transition: Use Jarate to reveal a cloaked Spy. Jumper Stumper: Kill a rocket or grenade-jumping enemy in midair with your Sniper Rifle or the Huntsman. Kill Everyone You Meet: Kill 1000 enemies. Kook the Spook: Kill 10 Spies with your Kukri. My Brilliant Career: Top the scoreboard 10 times on teams of 6 or more players. Not a Crazed Gunman, Dad: In a single life, kill 3 enemies while they are achieving an objective.